Hard to believe, but Sanctuary on Camelback Mountain is celebrating its 10th anniversary this year. Why, I remember when this chic hotel was just the Paradise Valley Racquet Club (not really, but it's fun to pretend). So what is Sanctuary on Camelback doing to celebrate? Why, they're giving you presents, of course! 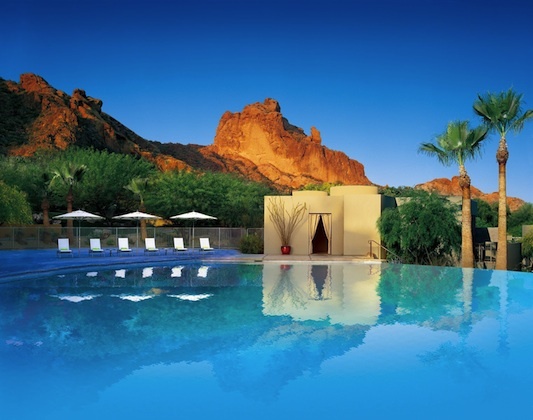 Throughout 2012, the Scottsdale resort is giving away 10 surprises at random to hotel guests. I'm not talking about a crappy mint on your pillow, here. On the books are swank room upgrades, a voucher for a complimentary two-night stay and a private one-hour cocktail party under the stars at edge bar. And, Scottsdale locals will be happy to know that Sanctuary Spa is giving away a one-year spa membership to someone in the neighborhood.